If you have a fairly new website or one where you rarely publish new content, chances are your website hasn’t been indexed on Google or similar search engines (read Bing, Yahoo, Yandex etc). In this article, I’ll show you how to submit your website to search engines like Google, Bing, Yahoo & Yandex step by step. Unless you’re regularly publishing content on your website, it could take search engines weeks or even months to just index your websites or blogs. Even after your website appears on the search engines, you’ll probably have a hard time ranking your website to the top. If that’s your case, the best way to ensure that your website is indexed by search engines is by directly submitting your website URL to them. Google alone has an indexed database of hundreds of billions of pages & it’s easy for search engine crawlers to miss out your site. Submitting your website helps them find your site. It will help you index your website faster. It’s better to take a few minutes and submit your website rather than waiting for days or even weeks. It helps the search engines understand your website and get information about what are the important pages on your website. Search engines often prefer manual submission. Apart from talking about how to submit your website or blog to search engines, we will also discuss how to prevent search engines from accessing or crawling certain parts of your site. How to submit a single, individual URL to Google. Google is the biggest search engine and the best source for generating organic traffic. Submitting your website to Google is pretty simple and only takes a few steps. 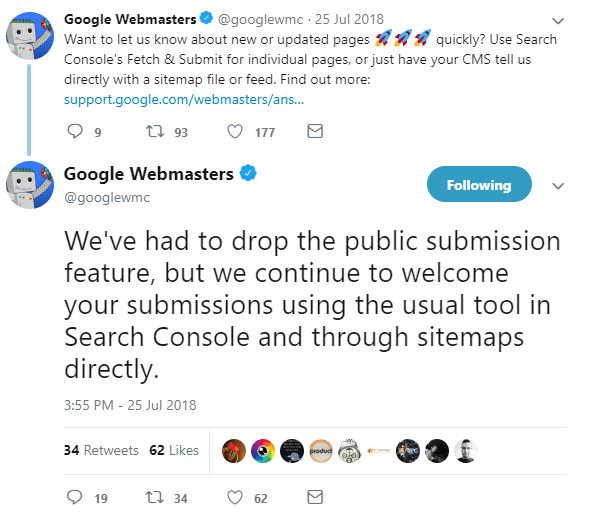 To submit your website to Google, you’ll have to use the Google Search Console. Previously, Google had a link submission tool which unfortunately got discontinued. So, the only way to submit your site to Google is using the Google Search Console. And this is done by submitting your sitemap or a specific URL on your site. A sitemap is an XML file that contains the list of all the pages on a website. If you don’t have a sitemap yet, you can easily create one. You can use Yoast SEO plugin if you’re using WordPress CMS or use a sitemap generator tool for static websites. To submit your sitemap, go to Google Search Console > Select Property > Sitemaps > paste Sitemap URL > hit Enter. And, that’s it. You have successfully submitted your website to the search engines. If you’re using the old version of the Search Console, you can follow these steps. Go to Search Console > Select Property > Crawl > Sitemaps > Add/Test Sitemap > paste Sitemap URL > hit Submit. So, you’ve submitted your website to Google for indexing. But, what if you want to submit individual pages or URLs to Google? Well, Google lets you do that using the Search Console. But, you’ll have to use the old version of the Google Search Console because the new version is still in beta and doesn’t provide this feature. The new Search Console provides a different way to submit individual URLs about which we’ll discuss below. But first, let’s see how you can submit a single/individual URL to Google. In the old version of the Search Console, there is a tool named “Fetch as Google” that lets you submit pages. You can find this tool by going to Search Console > Crawl > Fetch as Google > paste the URL > Fetch. The work isn’t done here. Now, you need to request the submitted page for indexing. Click on the request for indexing box and prove that you’re not a robot. You can also choose whether you want to crawl only this URL or crawl the URL and its direct links. Now, let’s talk about how you can do the same using the new Search Console. Google replaced the “Fetch as Google” tool with the “URL Inspection” tool in the new version. This tool simply inspects the URL you enter and uncovers the issues associated with the URL. It also shows the index status of the URL. To find this tool, go to the new version of Search Console > URL Inspection Tool > paste URL. If your URL is not indexed, it will show a request for indexing button. Click on the button to submit the URL for indexing. Just like Google, submitting your website to Bing is pretty straightforward too. And, this can be done using the Bing Webmaster Tools. You will have to submit your sitemap to Bing Webmaster Tools to fully submit your website to Bing. 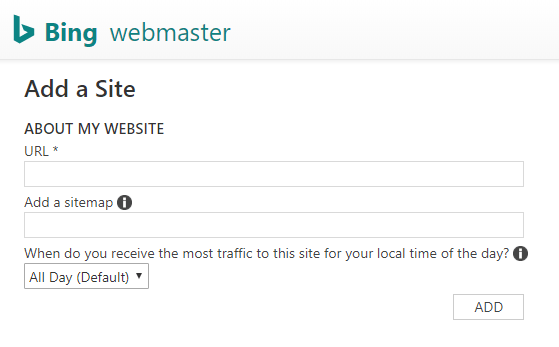 You can find the option to submit the sitemap by going to Bing Webmaster Tools > “Add a site” > fill the form > click “Submit”. Submitting your website to Bing will also automatically submit your website to Yahoo Search since Yahoo uses Bing’s search index. Just like Google, Bing also discontinued their link submission due to too many low quality link submissions. So, there is no way to submit an individual URL to Bing at this moment. You’ll have to submit your sitemap to the Bing Webmaster Tools. Since 2010, Yahoo’s database is powered by Bing you if you’ve registered your website on Bing, you’ve got your back covered. Yahoo will pick your site from there. For 90% of bloggers and website owners, submitting your site to Google, Bing and Yahoo is the only thing you need to worry about. So, if you’ve completed all the steps till now, you can go relax. Please Note: If you’re website audience is largely based in China or Russia, you need to make sure your site is submitted (and indexed) by Baidu & Yandex, respectively. Baidu currently holds 9.1% of the total global search engine market share (which roughly translates to70% search engine market share in China) and Yandex has over 55% search engine marketing share in Russia. Let’s see how to get your website listed on Baidu & Yandex. Submitting your website to Baidu and Yandex is just the same as submitting your site to Google or Bing. To submit your site to Yandex, you’ll first have to create an account on Yandex Webmaster Tools and add your site. The next step is to verify the ownership of your website. There are many methods you can choose from but if you’re on WordPress, I’d recommend you to choose the meta tag method. Yoast SEO > General Settings > Webmaster Tools > paste Yandex code. 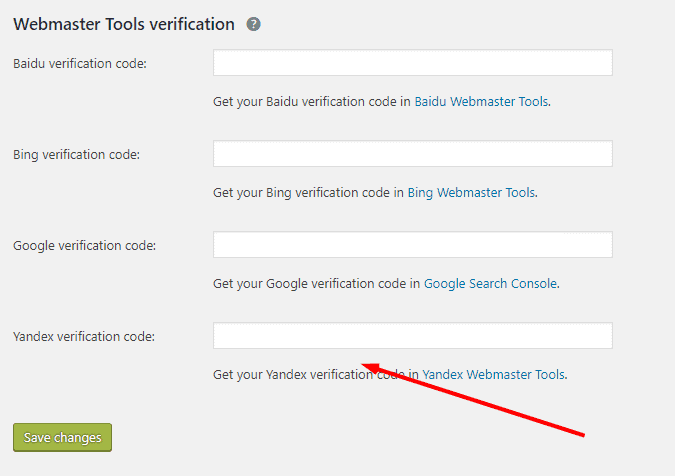 How to verify Yandex using Yoast SEO (Similarly, you can verify Google’s search console & Bing’s. Once your website is verified, go back to Yandex Webmaster Tools and head over to Indexing > Sitemap files > paste Sitemap. That’s it. You have submitted your website to Yandex search engine. Now, let us see how you can submit your website to Baidu. To submit your website to Baidu, you can use their link submission tool. Go to Link Submission tool > paste your link > hit “Submit”. That’s how you submit your website to Baidu. Pretty simple, right? You can also submit individual pages to Baidu and Yandex search engine. To submit a single page to Yandex, go to Webmaster Tools > Indexing > Check URL Status > paste URL > hit “Check”. The Check URL Status tool will check for the status of the URL you submitted and will show you the index status it. To submit a single URL to Baidu, you can use the same link submission tool we used above to index a site on Baidu. Sometimes, there are pages on your website that you don’t want to be indexed on the search engines. Once you submit your website for indexing, it basically indexes all pages. So, how do you prevent specific pages from being indexed by the search engines? 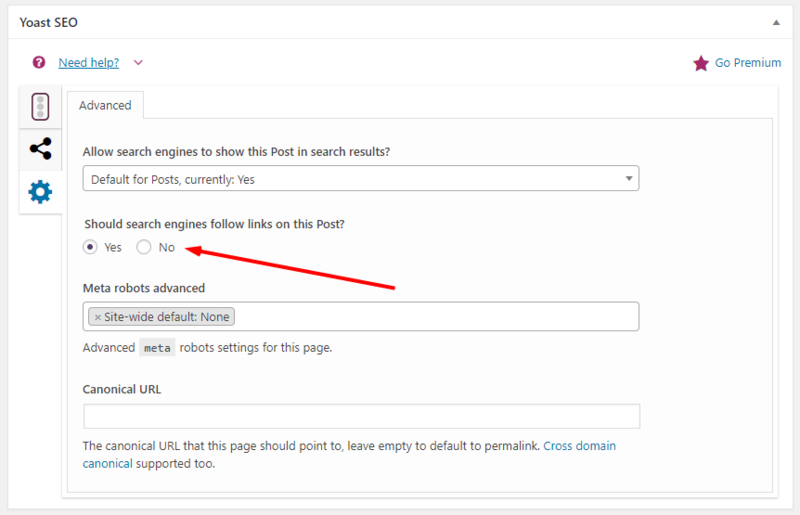 Well, if you’re using WordPress, you can enable the no-index tag on Yoast SEO plugin. This will prevent that particular page from being indexed by Google or any other search engines. So, you have submitted your website to Google. But, it still isn’t appearing on search results. When your site doesn’t appear on Google (or similar search engines) it doesn’t mean there is something wrong with your site. There are many common reasons as to why this happens. Here are some ways to fix this problem. Your website has a no index tag which prevents Google from indexing your website and its pages. Check if your website has a no index tag and remove it. Check whether your Robots.txt file is blocking a URL. Use the Robots Testing Tool by Google to see if a URL is blocked or not. Check your .htaccess file and see if it contains a ‘noindex’ or ‘nofollow’ tag. If you’ve recently submitted your site to Google, it might take some time. The best way is to wait. Having said that, you can use the index status report to monitor crawl progress. You can also use Google’s URL Inspection Tool to check the status of a URL. Go to Search Console > URL inspection > enter URL > hit ‘Enter’. This tool will show whether a URL is indexed by Google or not. It also shows details and the reason why a page is not indexed. Submitting your website to search engines is very simple and will help you get your new website indexed quickly. Do comment below if you have any questions regarding submitting your website to search engines. 1. Will Google Find New Pages On My Site? Once you’ve submitted your website on Google, Google bots (spiders) will regularly crawl your website for new content. Once they find it, they will index it and your new pages will show in the search results. Another way Google (and every other search engine) finds new pages on your site is via mentions or links of your page on other sites. Backlinks form a path for spiders to discover newer content. 2. Should I Submit My Site To Directories? Directory submission was an effective method to get your site indexed on Google faster. Not anymore. Directory submission has zero benefits these days. 3. Why Is My Site Not Appearing On Google Despite Submission? Google needs to index your site in order to have it appear on Google. This process can take weeks if not months so there is nothing you can literally do to speed up the process. But, in case you’re worried you can check Google’s webmaster guidelines to ensure your website is not violating any rules. 4. How To Get My Site To The First Page Of Google? You need a healthy mix of high quality content and links (to those pieces) get your site to the first page of Google. That is a whole topic on it’s own. You can read about how to increase your rankings here. Alternatively, make sure your content on the page you want to rank follows all the on page SEO techniques that are a must to get to the top of Google. Here is another guide to SEO in 2019 with tips about how to optimize your site to rank, not only on the first page, but also in the top 5 positions. 5. How Does Google Rank Any Website On It’s SERPs? Google has a very complex and ever evolving algorithm system comprising of over 200 different ranking factors to gauge any website’s quality before ranking it on it’s SERPs. Google also employs human search quality raters to gauge the quality of a website and how it performs or solves users’ queries before ranking any website for a term. 5. How To Submit Your Website To DuckDuckGo? DuckDuckGo is gaining massive popularity these days all thanks to its privacy focused search engine. However, you literally have to do nothing to get your site listed on DuckDuckGo. DuckDuckGo finds you itself and ranks your website based on its ranking factors. Wow… what a complete guide for a post as how to submit website to search engines google & bing. This guidance is interesting to learn the right way to submit a website to Google on Bing.